It is amazing to think that there are still trees that existed way before the pyramids were built. 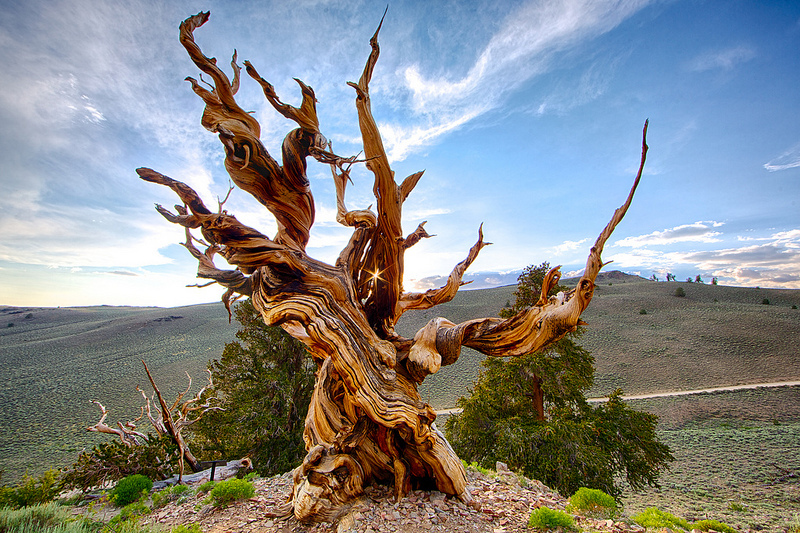 The Methuselah tree is a 4850year-old Great Basin bristlecone pine tree growing high in the White Mountains, California. Until 2013 it was the world's oldest known non-clonal tree. 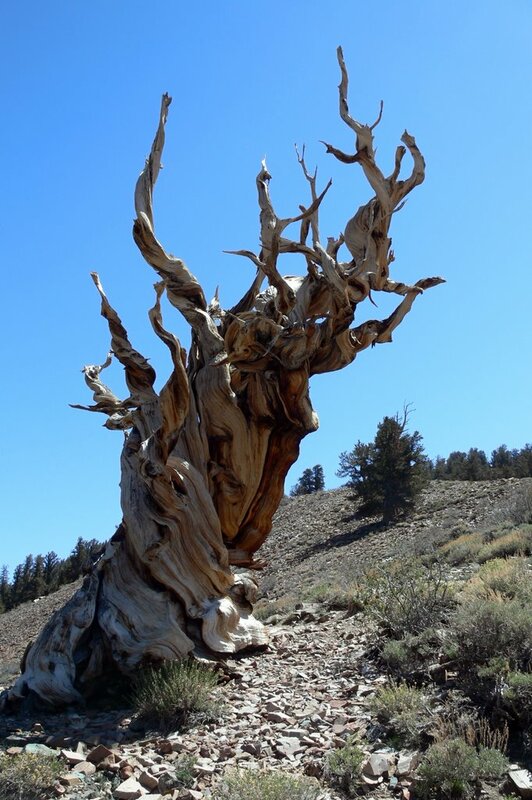 However in 2013 an even older bristlecone pine was found in the same area with an age of 5069 years (in 2015). The secret of the trees living for so long time is not so much in the environment, rather than the tree itself. The bristlecone pine has evolved survival strategies that help it cope with one of roughest environments on the planet for thousands of years. To protect the trees from vandalism the exact location of the trees is undisclosed. There are also no published photos of the exact two oldest trees, just some random trees in the Methuselah grove. So the tree in the picture might be either one, but might as well not. The White Mountains area is a fairly popular hiking area with an easy access. The trees grows somewhere between 2,900 and 3,000 m (9,500 and 9,800 ft) above sea level in the private://Methuselah Groveprivate:// in the Ancient Bristlecone Pine Forest within the Inyo National Forest. 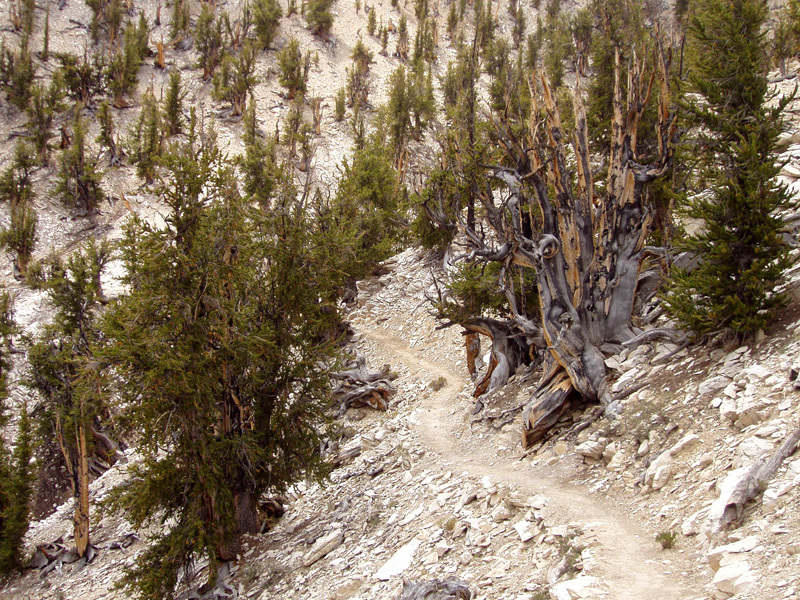 There is path called Methuselah walk that allows hiking around the grove of old trees. To protect the oldest trees in the world, the exact location of the trees is undisclosed, which is good. Hiking in the area is free.